Performing arts have visioned and visualized the question of violence, from varying and different perspectives. Violence is also built into the structures of various performance traditions. This volume maps the different and multiple dimensions of the relationships between violence and performing arts. It addresses the nature and politics of the representation of violence, problematizing not only depiction of violence ‘aesthetically’, impersonally with a veneer of objectivity but also ‘pleasurable’ reception of violence. It underlines that politicizing aesthetics would challenge valourization, aestheticization and making of violence appear beautiful. In the depiction of violence, unlike the electronic media which attempt to create virtual reality, man made world of ritual/theatre transmute what is unbearable in everyday context - calamities in individual and collective life. Performance has often been an invigorating arena for cultural resistance – a potentially subversive cultural medium of expression, with its innate power of destabilizing the status quo. 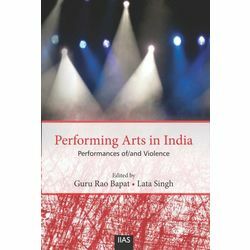 This volume highlights how performance has emerged as a major site of resistance against the structured violence based on caste, class, gender, sexuality, minorities, etc. Violence and performing arts would further get problematized by foregrounding the voices of marginalized section. Hence, performance itself is becoming a target of violence and subjected to moral policing even in non-violent situation. This raises the fundamental question of freedom of expression. The volume also addresses the question as to whether performance can flourish in a violent atmosphere and what is its role for communities ravaged by violence. Such questions need to foreground political culture and the nature of democratic movements and creative expressions of different regions. Number Of Pages : 242 p.